Installing a spa in your home or on your patio is a great way to indulge your senses, relax your mind and even improve your health. An outdoor spa is a big investment, but it is well worth the cost, especially if you know what to look for. Here are five things you need to look for when you go spa shopping. When you buy a spa, you are making an investment in something that will provide years of relaxation and fun. When you shop for an outdoor spa, you will need to look carefully at the materials and make sure they are of the highest quality. Outdoor spas in particular need to be able to stand up to the elements. From the harshest sun to the coldest ice, your spa will need to withstand everything nature can throw at it. When the time comes to install your new spa, you must keep in mind that you will need a firm level surface for the hot tub. Many believe this means that you will have to mix and then pour a concrete base, but this is not always the case! There are a few alternatives to pouring concrete in the location of the hot tub. For instance, well-laid pavers could get the job done. You’ll want to make sure that the surface is even before they are installed to avoid shifting when the hot tub is installed. Another alternative is this portable plastic pad system. This system has been around for years, and is a quick and reliable alternative to concrete, or even pavers! Great customer service is always important, but it is even more essential when making a major purchase like an outdoor spa. You will want to work with a company that has a stellar reputation for quality customer service and a commitment to quality. Spas and Stuff has been a BBB accredited business since 2007 and has an A+ rating! A company that provides top notch service and shows a willingness to answer your questions is likely to be there for you if something goes wrong. The right service can make a huge difference when buying and using your outdoor spa, and you do not want to skimp in this vital area. You will need energy to power your outdoor spa, but that does not mean it has to break the bank. Some spas are more energy-efficient than others, and choosing an efficient unit will keep your power bill under control while you enjoy your daily soak. 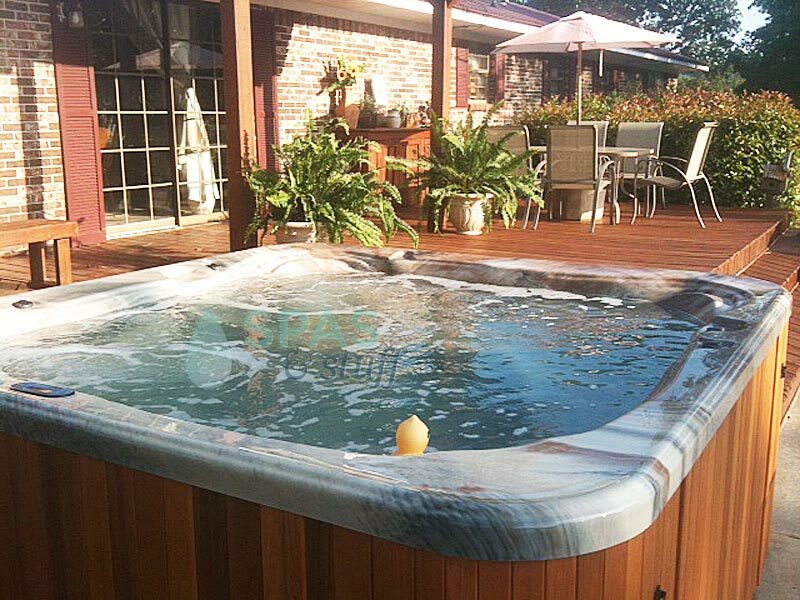 Choosing an energy-efficient outdoor spa will also mean you can use it more often. You will be able to relax and enjoy your spa without worrying that it is costing you too much money. While the spa itself is the most important part of the picture, a few creature comforts can make the experience that much better. If you want to enjoy a glass of wine while soaking in your spa and watching the stars, a built-in tray table or bottle holder will be well worth your while. A quality step will make getting into and out of your spa a lot easier, while a stereo hookup and lights will delight your eyes and ears while you relax. Modern spas come loaded with creature comforts, so you should not have much trouble finding the right combination of extras. Before you know it, you will be relaxing in your outdoor spa and soothing away the cares of the day! Spasandstuff.com has a wide selection of spas available for sale. Browse our selection to find one that’s right for you! This entry was posted in Hot Tubs on March 27, 2015 by admin.